Stuff flying through the air is always fun. Unless you’re the owner of the priceless vase which happens to be in the way of the otherwise-graceful arc, but that’s obviously not going to happen to you, right? You’re more careful about aiming. Ahem. Even better is making things you really really don’t like sail through the air with the greatest of east. 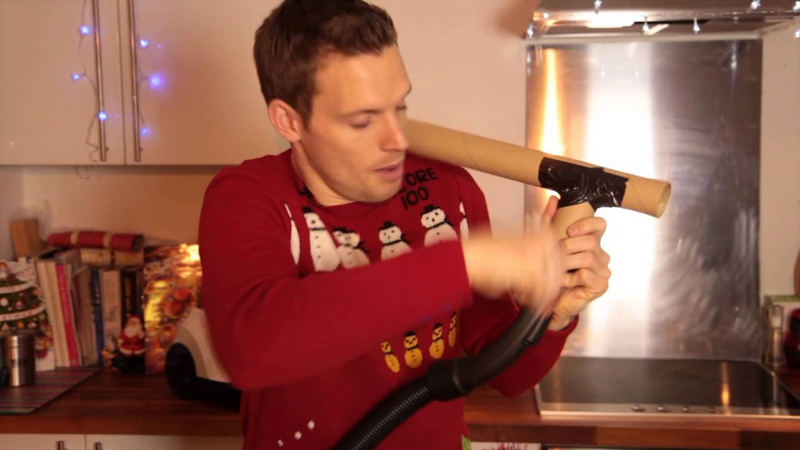 Above, TV presenter Greg Foot dons his best festive jumper and uses a vacuum clear to hurl his hated brussels sprouts as far as possible. This sort of vacuum bazooka is a classic thing to make, and while it can be a bit fiddly it’s well worth having a go if you’re feeling bored over Christmas. Merry Christmas. And do try not to put anyone’s eye out with flying objects.